I tricked [Andy] into stopping by my house for lunch yesterday. (Easy enough–I merely offered to take him to [Wenelli’s].) 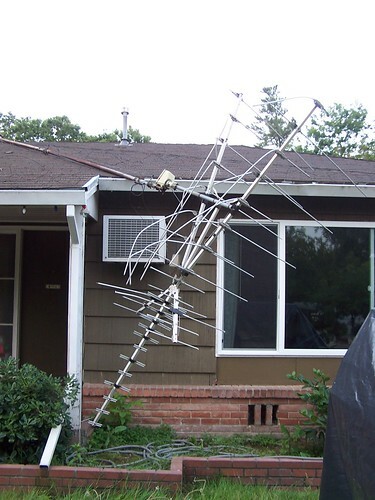 We tried to salvage the TV antenna before the roof gets stripped. We tried to let the mast down using a single guide line. This might have worked, except that the roof-mount (where the mast attaches to the roof) gave way. What we *should* have done is attach two guide lines, and possibly get a third person with a long stick underneath the mast to help support the weight. Oh well… The antenna may still be functional. I’ll try straightening out the antenna elements later.